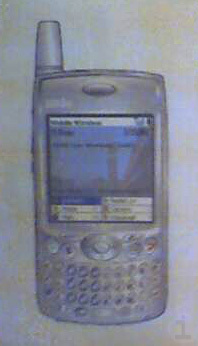 What appears to be a camera-phone picture of a slide or printout detailing the next generation Treo has been posted to the discussion forum at TreoCentral. According to the details listed on the picture, the next Treo will retain the same basic form factor and layout with a number of improvement, It will be powered by Palm OS 5.x, have 32MB of RAM and a 312 MHz ARM processor. It will include integrated Bluetooth and a 320x320 pixel, 65k color TFT display. The smartphone will also have a new camera with digital zoom and video capture, dedicated answer and disconnect phone buttons and a SD/MMC expansion slot with SD I/O. The report also claims a number of web Browser enhancements. The source image lists the release timing as Fall 2004, but does not offer any other details on price or availability. You can click on the image on the right for the full slide. palmOne CEO Todd Bradley has repeatedly mentioned that they are developing a family of smartphones due in the Fall. Thanks to Guarav for the tip.